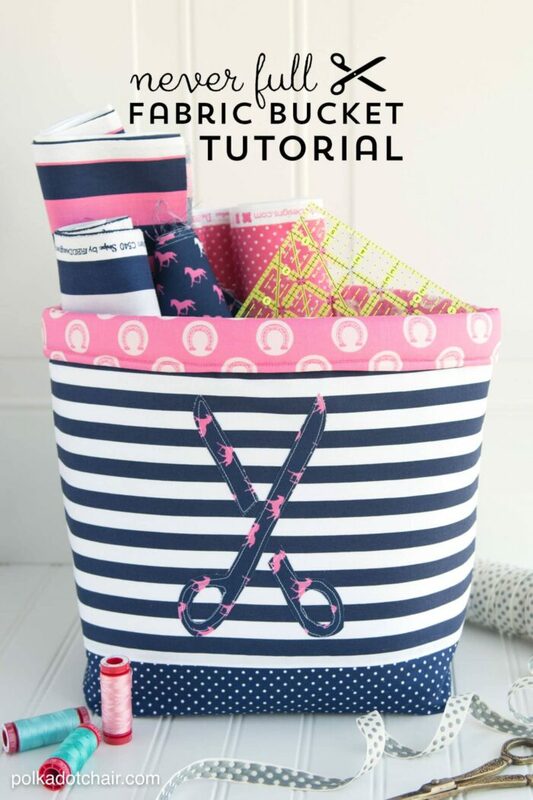 This Fabric Basket Sewing Tutorial is the perfect project to help you organize your sewing room or craft space! 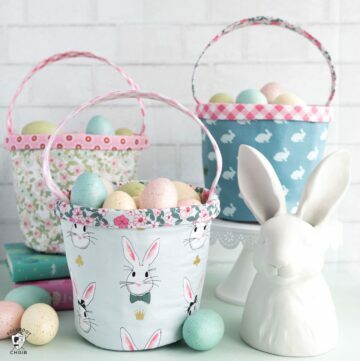 Make a bunch and keep them stashed all over your house. 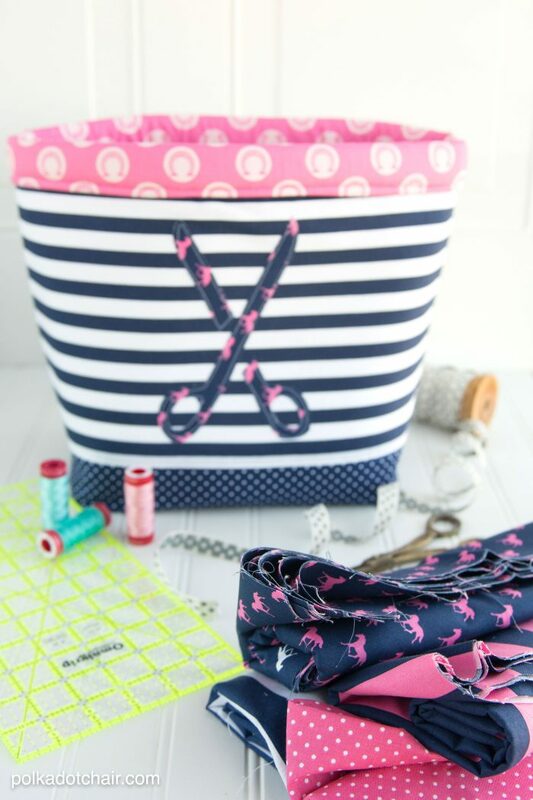 Today I’m going to share with you a project using some of my first fabric line with Riley Blake Designs, Derby Style! 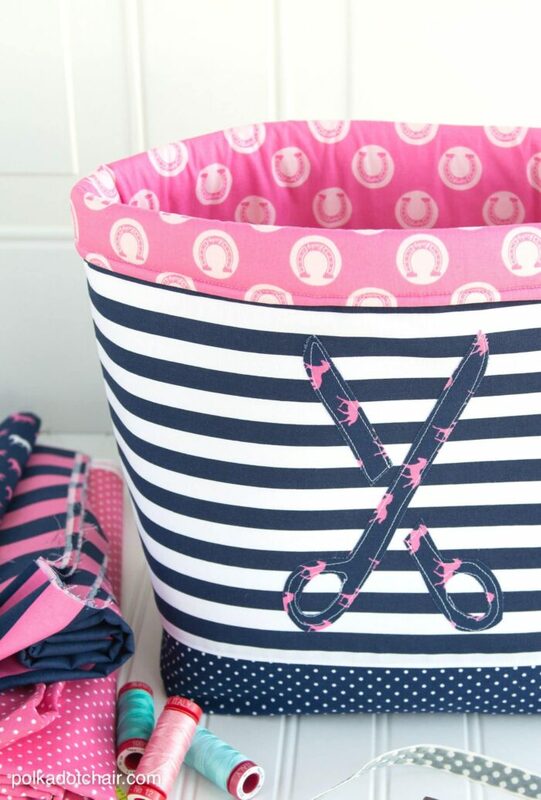 Today I’m going to show you how to make this nifty fabric storage bin! 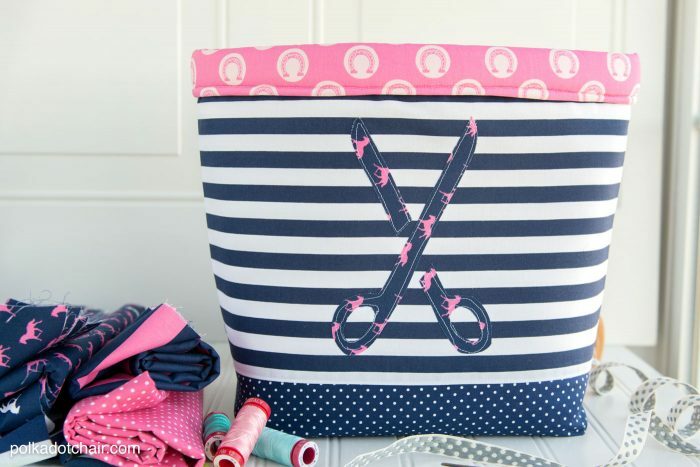 It’s roomy and soft and perfect for storing stuff in your sewing or craft room. Begin by cutting a 3″x3″ square from the bottom two corners of the 17″ side of the 17″ x 6″ pieces and the 17″ x 17″ lining pieces. 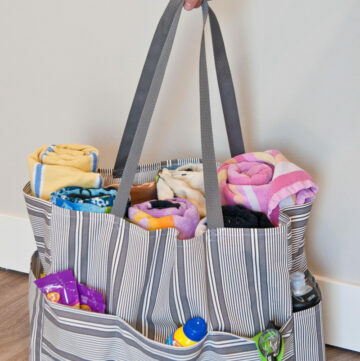 Next, sew the 12″ x 17″ basket front piece to one of the 6″ x 17″ pieces. Press the seam open. Repeat for the basket back piece. 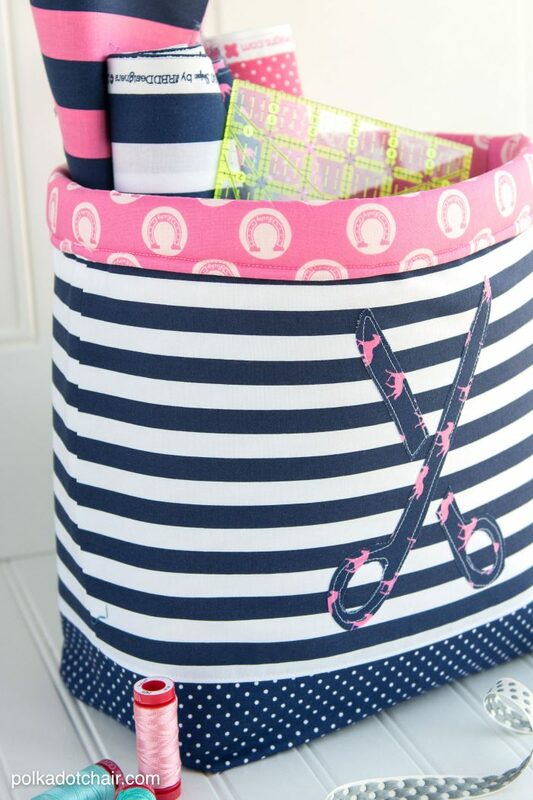 Cut the interfacing to the same size as the sewn basket front and back pieces. Press the interfacing to the wrong side of the basket front and back pieces. Top stitch along both sides of the seam between the basket fabric and the bottom fabric. Do this for the front and the back pieces. 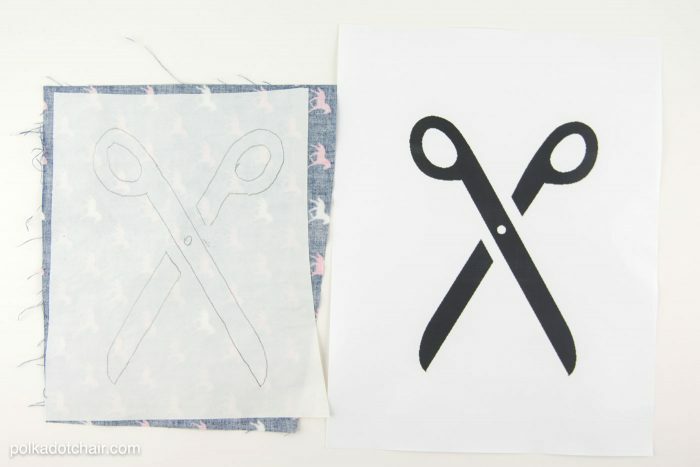 Print out the scissors template (can be found here). Trace it onto a piece of paper backed fusible web. Cut out loosely. 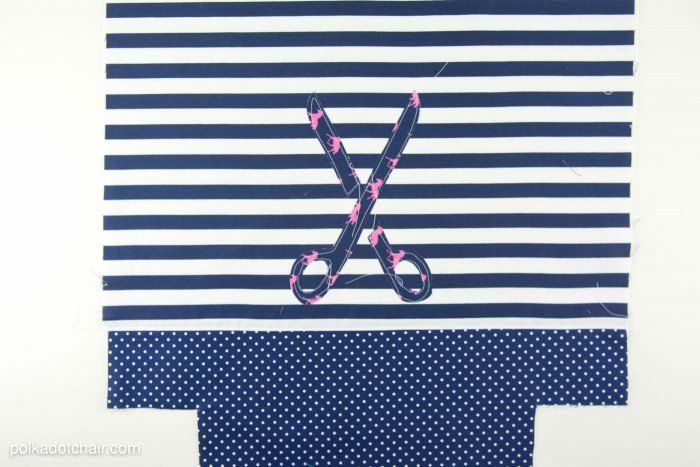 Iron onto the wrong side of the scissors applique fabric. Cut out. Stitch around the outside of the applique. 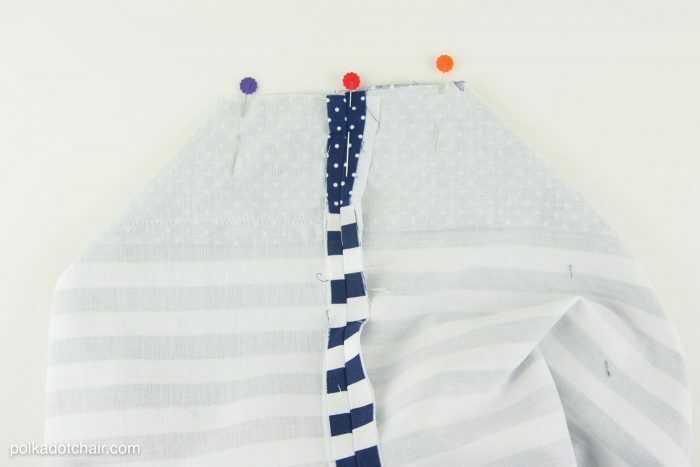 Sew the basket front and back pieces together along the bottom seam. 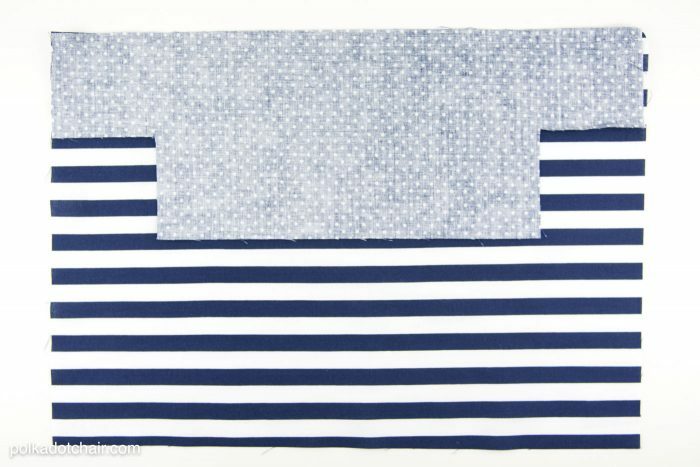 (Just the straight seam, don’t sew in the spot that you cut the 3″ square from) Press seam open. Sew the two sides seams of the tote. Press seams open. 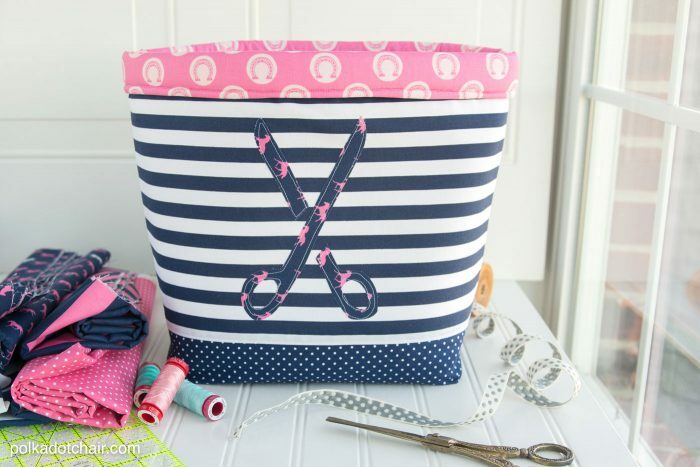 Pinch the bottom corners of the basket so that the raw edges of the portion of the bag with the 3″ square cut out meet. Stitch with a 1/2″ seam allowance, making sure to backstitch. Cut two pieces of foam interfacing the same size as the two lining pieces. Make a “sandwich” with the two lining pieces inside right sides facing and the two foam pieces on the outside facing the wrong side of the fabric. 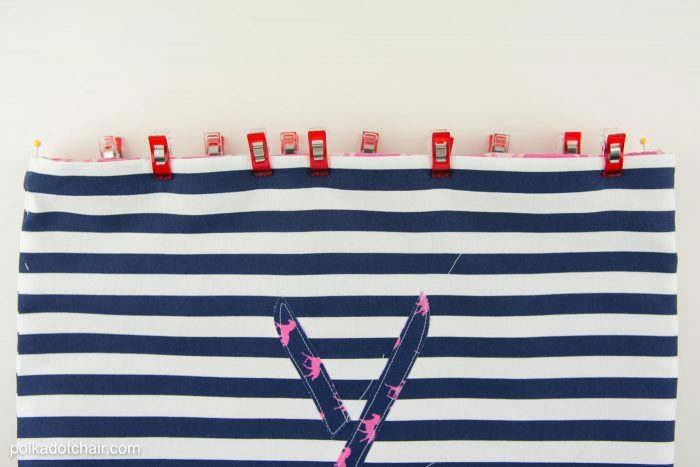 Sew the lining pieces together the same way that you sewed the tote bag outside pieces together. If you have a walking foot it will be helpful for this step. Slip the lining into the basket outside piece, wrong sides facing. Turn under the top raw edges 1/2″ and secure in place. 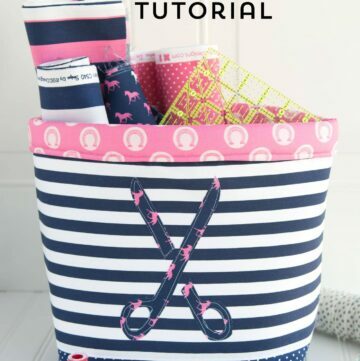 Using a walking foot (if you have one) stitch around the top of the basket close to the fold. Now fill it up with all of your goodies! I love Derby Style! I made a quilt for my daughter-in- law’s birthday, a bow tie for my son, and now I started a bow tie quilt for my son. They went to the Kentucky Derby, so this fabric is perfect for them. Oh I’m so happy to hear that!!! Hello Melissa Mortenson! I just came across this tutorial off of Pinterest and I love it!! 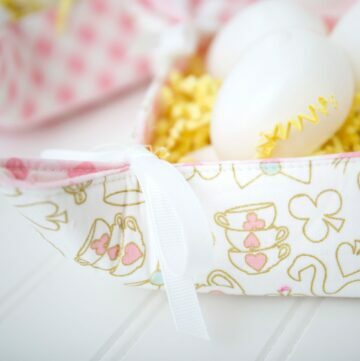 I am wondering where you bought the fabrics from and all the details like the type and name. I really want to make one just like it! It is super cute, thank you for the great tutorial. Thank You Melisa for the pattern ! You mentioned a block of the month series, I looked and could not find it. Can you be so kind to add a link to it. Again thank you, hope you have a joyful weekend! Just type “block of the month” into the search box.